The idea of celebrating 20 years of his company with a retrospective program of highlights is not, I imagine, one that Richard Alston would countenance. But clearly a lot of careful thought has gone into the program at Sadler’s Wells — modestly titled ‘20th Anniversary Performances’ — that says less about the past than the present. Alston has created a new work, Rejoice in the Lamb, which receives its London première, and associate choreographer Martin Lawrance has his own London première of Burning in addition to Madcap from 2012. The remaining slot on the program is filled with the world première of Nomadic, a joint adventure in which Alston shares the choreography with dancer Ajani Johnson-Goffe. Those who prefer a more concentrated Alston program will have to wait for the company’s upcoming UK tour. At the end of 2013 Alston produced an evening of work that celebrated the music of Benjamin Britten to mark the composer’s centenary. It was as much a celebration of Alston’s choreography as it was of Britten’s music because their sensibilities seem so well matched. Rejoice in the Lamb, which Alston created perhaps in that same flush of inspiration to Britten’s 1943 setting of Christopher Smart’s poem of the same name, opens under a pale blue light with a circle of dancers woven head to toe on the floor and a pensive Nicholas Bodych crouching like a luminous gargoyle to one side. He is Christopher Smart, 18th century poet and man of fervent religious faith who was susceptible to bouts of depression; his sustenance was music and poetry. He also had a steady companion in Jeoffry, his cat, danced here in tabby colours by Ihsaan de Banya. Smart and Jeoffry are the only two named characters; the remaining cast of five women and three men are possibly an expression of the joy and simplicity of Smart’s mind. As soon as Bodych begins to move, the measure of Alston’s own peace of mind is clear; there is a quiet economy in Bodych’s gestures, unadorned and free, that extends to the entire cast, giving Rejoice in the Lamb a serenity that the pastel colours of the costumes by Peter Todd and the lighting by Zeynep Kepekli enhance. Alston is evidently still in love with making dances and his dancers respond with a clarity that is a pleasure to see. This is quiet dancing with moments of stillness and humour; Alston does not have a repertoire of difficult steps but they are precise and when danced well, as they are by the entire company, they move effortlessly with the music. Martin Lawrance’s Burning is a piece in the style of Alston but without his most endearing qualities. Set to Franz Liszt’s Dante Sonata played on a grand piano by Amit Yahav, Burning is about the composer’s relationship with Countess Marie d’Agoult (Nancy Nerantzi) and his many other liaisons with adoring women. As soon as Liam Riddick (as Liszt) begins his introductory solo it is clear we are in for a bumpy ride; Lawrance’s choreography is simply not on the same plane as the music. Not only that but he translates Liszt’s relationships into bruising, harsh duets that read as serious abuse. Lawrance may have historical evidence to justify it but if he does he is imposing this on the music and it jars. Gestures and dance are separated from the music, solos begin without narrative intent and there’s just too much choreography that gets lost on the floor. Burning may well refer to Liszt’s passion for Marie but it is expressed in the music rather than in the dance. 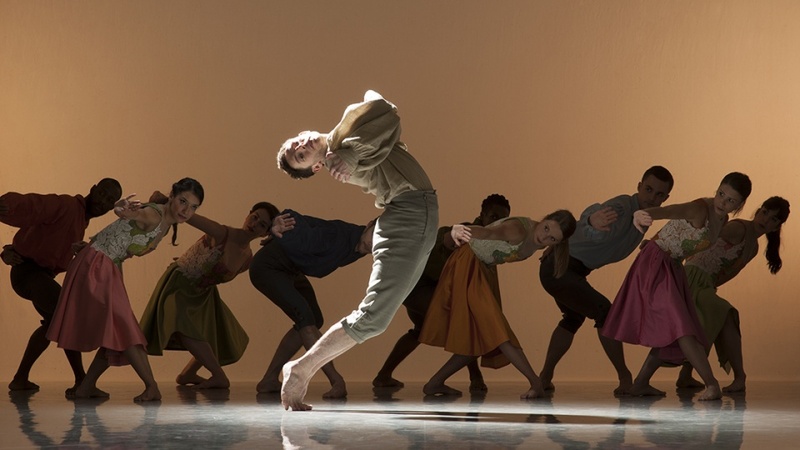 Nomadic is Alston’s first-ever joint choreographic venture, but his stake in it is unclear. Co-choreographer Ajani Johnson-Goffe, who also dances in it, has an idiosyncratic way of moving that separates him from the rest of the cast; when he dances the choreography makes sense, but when his movements are embodied by others it doesn’t. Alston’s dancers weave their patterns and their duets tirelessly but the energy of Nomadic is drawn down by an internal gaze that give the impression the dancers are listening to the music of Shukar Collective through earphones. What is missing is a sense of cohesion, that intangible element that nomadic tribes must cultivate in their wandering lives. Alston offers the place of honour on the program to Lawrance’s Madcap, set to ‘possibly two of the most challenging pieces I have ever tackled’ by Julia Wolfe (Lick and Believing). Just as with Liszt’s Dante Sonata, Lawrance’s choreographic form tends to write over the music with his ideas rather than delve into its structure and some of the elements that weaken Burning reappear here: a concentration on highly physical male solos (for de Banya and Riddick) in a company of lyrical women, an overdependence on floor work and an unsettling violence in a duet between Nerantzi and Riddick. This is not a natural closer to an evening of dance, let alone to a 20th anniversary of what Alston and his dancers have achieved. Whatever the reasons for the order of program, the memory of Alston’s beatific Rejoice in the Lamb eclipses what follows.